The President of the Board of Directors of FUNDECI, Miguel d'Escoto Brockmann, speaks on his term as President of the General Assembly of the United Nations, in New York. The planet earth has perhaps four million species of animals, plants and other living organisms, of which we have documented a small proportion. Even of those documented species, not much is known about many of them. Our knowledge of what these species need to continue to survive in healthy, stable populations is vital to prevent drastic loss of biodiversity. Lirimiris truncata is ﻿documented from Mexico to Venezuela, but it there is no record of it found in Nicaragua. It is a member of the family Notodontidae, of which only eleven species have been documented in Nicaragua. 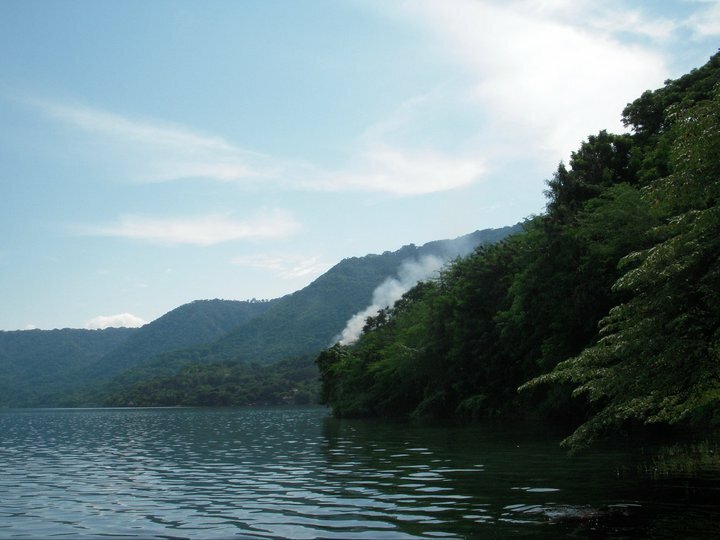 Its larva have been found on trees such as Cordia alliodora (Black Laurel) and Guazuma ulmifolia (West Indian Elm), both of which are abundant in Laguna de Apoyo Nature Reserve and the Pacific eco-region of Nicaragua. 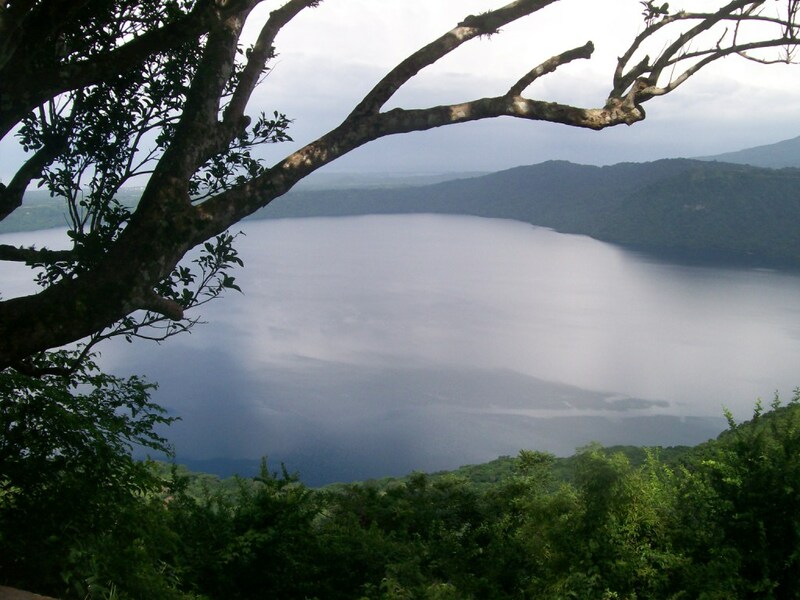 Laguna de Apoyo Spanish School "Proyecto Ecologico" is operated by FUNDECI/GAIA and is the oldest continuously operating Spanish language school in Nicaragua. We provide Spanish language and culture instruction for groups both small and large, as well as for individuals. Individual classes allow for customized instruction so the student covers the topics that are most appropriate given his or her current level and interests. 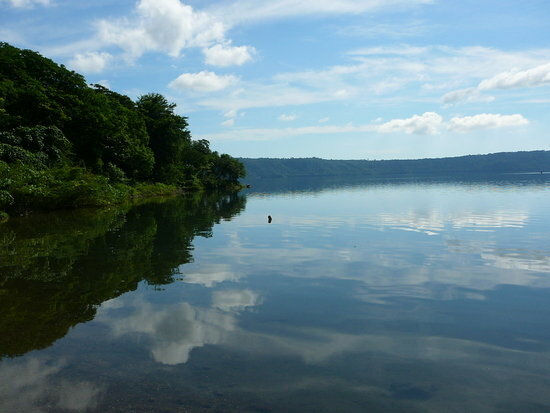 We are located inside the Laguna de Apoyo Nature Reserve, so classes are held in a natural environment. Classes might be interrupted by a group of howler monkeys overhead, or a unique bird calling from nearby. 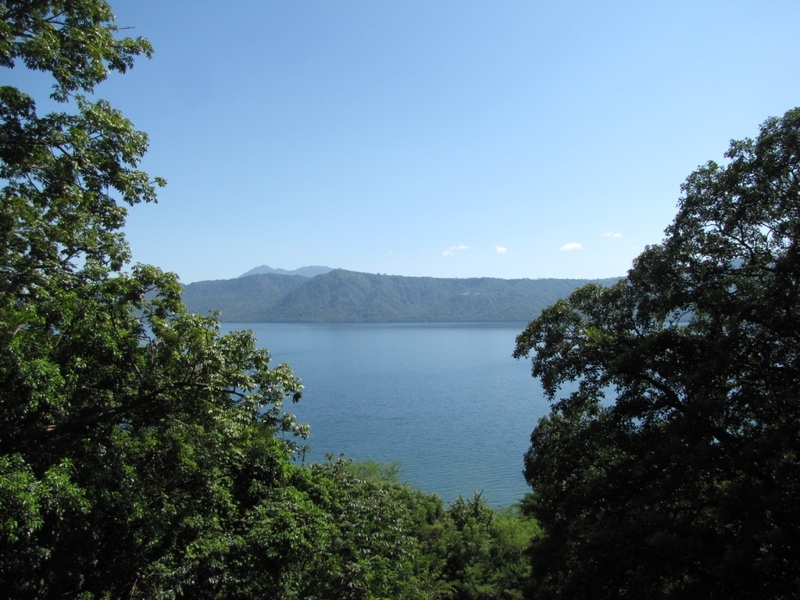 We are along the shore of Lake Apoyo, a beautiful, clear lake, and among a handful of residences and small tourist enterprises with the jungle behind and overhead. 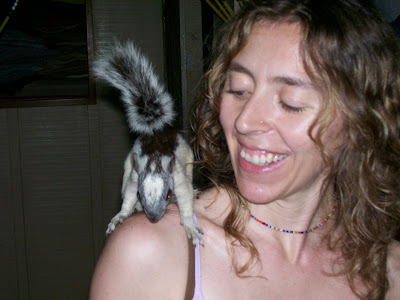 Aura and her student, Hester, are very animated during Spanish class at Proyecto Ecologico. Photo by Jeffrey McCrary. Fresh air and greenness all around make a special learning environment. Our students learn with local teachers who were trained by us. Our school has trained the teachers of most schools in the country, in workshops on one-on-one and small group intensive language pedagogy. Our teachers can convey the principles of grammar and conjugation in Spanish, and they also can discuss issues of local importance: politics, the environment, local wildlife and nature, and the life of ordinary, rural people in Nicaragua. Something was funny during Spanish class today. Photo by Jeffrey McCrary. Our students develop a study plan with their teacher in one-week blocs. During the week, each student's progress will be monitored and the study plan will be altered accordingly. Given that every student learns at a different rate, we have found letting the student's learning pace drive the study plan makes for better progress. Our teachers have developed a multilevel skeletal study plan which can be adapted to a student's particular interests and needs. Our study guides have been "pirated" by several other schools in Nicaragua, a clear demonstration of the success of our methodology. Leslie and a student hold class in the shade of large trees. Photo by Jeffrey McCrary. Each program includes a set of after-class activities, and volunteer work. We believe that we should give back to the community and the earth, humbly and gratefully. One afternoon each week is dedicated to reforestation of the Reserve. Spanish students are welcome to participate in volunteer work on a greater scale as well, and we have needs of several kinds-there is something for everyone to do. Leslie teaches Spanish with Dave in Laguna de Apoyo. Classes cover politics, cultural issues, and the environment. Photo by Stephan Beekhuis. We teach Spanish language courses at all levels, from beginner to the advanced student. Our students are interns and volunteers, newly arrived residents, and vacationers, from throughout Europe, Asia, and North America. If you would like to know more about studying Spanish with us, please contact us! Leslie and David pause to smile for the camera. Photo by Stephan Beekhuis. Click here to read one of the many blogs written by our Spanish students. Dorsal view of Automeris sp. captured in Laguna de Apoyo Nature Reserve. Photo by Louise Davidson. Ventral view of Automeris tridens captured in Laguna de Apoyo Nature Reserve. Photo by Louise Davidson. The scales from the wings and body easily scuff off, making their majestic forms difficult to preserve. ﻿﻿﻿They are arranged in delicate, subtle patterns of line and shapes. Beneath them is a network of veins which can be diagnostic for the identification of many moths. Although it has been recorded in eastern Nicaragua and as near as Domitila Private Reserve (just south of Mombacho), these photographs are of the first specimen recorded in Laguna de Apoyo Nature Reserve. It has also been recorded in Carazo and in nearby Guanacaste Department in Costa Rica. It joins the other more than 225 species of Lepidoptera (moths and butterflies) now documented in Laguna de Apoyo Nature Reserve. Some scientists - even in Nicaragua - seek moths such as this one to sell. 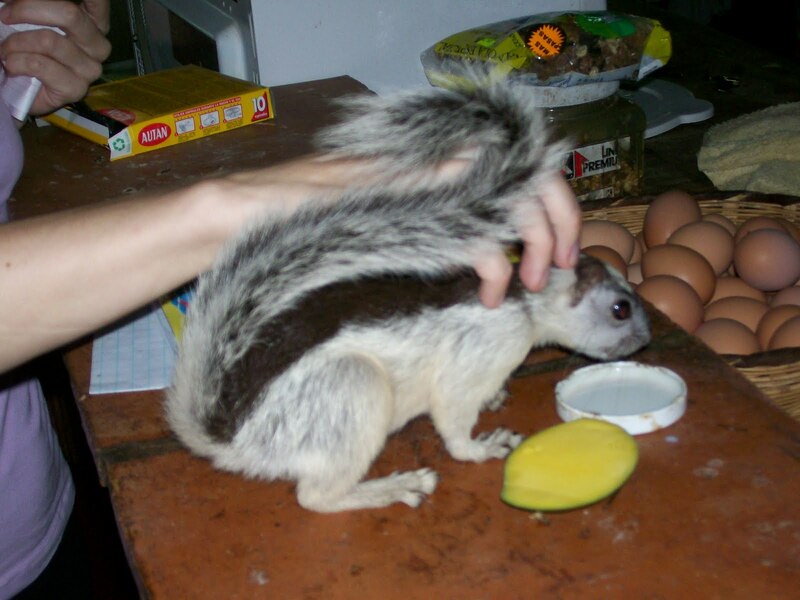 We do not think it is advisable for wildlife researchers to participate in the pet trade. We insist on reporting all exports of biological material duly, and we do not work with people who may confuse research and trafficking in wildlife. We have ended our association with at least one scientist over this issue, and we have reported what we knew about his activity to the Nicaraguan Police, who have passed the information to the FBI in the US, where an investigation continues. If you have evidence of someone trafficking in wildlife, please let us know. Would you like to help us identify moth species found in Laguna de Apoyo Nature Reserve and monitor their populations? Please contact us! Our little location offers many opportunities for nature tourism and volunteer opportunities. Tilapia aquaculture in natural water ecosystems, separated from a natural lake by only a net, not only wreck the natural habitats of the native fishes and other flora and fauna; they also provide inferior nutrition. The Bendbulletin blog has repeated the reportage of Elisabeth Rosenthal published in the New York Times, yet another example of the extent of importance of the issue. Americans ate 475 million pounds of tilapia last year. Much of that fish was farmed, and much of the farming is done by Asian and Latin American operations, including Aquafinca fish farm in Honduras, above, where tens of thousands tilapia filets are processed daily. We at FUNDECI/GAIA are very concerned about what we eat, and how our actions affect wild nature. We know tilapia aquaculture in the third world occurs without the safeguards for protection of nature required in the US, yet, the US purchases lots of tilapia from these third-world countries. Today, tilapia is found in most of the watersheds of Nicaragua. A few foreigners and very few (in fact, fewer than one hundred) Nicaraguans have obtained jobs from a high-profile tilapia aquaculture facility in Lake Nicaragua. 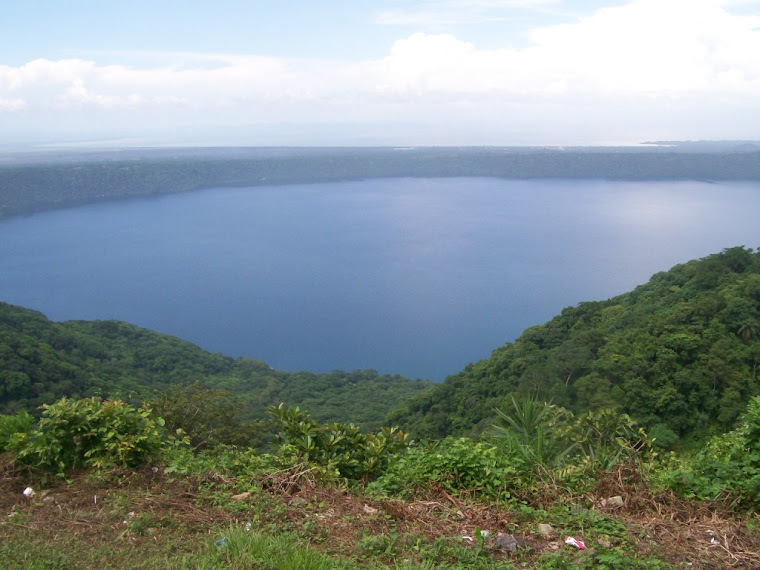 Considerable public sentiment was expressed against the facility, given the lack of interest of the business owners in providing jobs without wrecking Lake Nicaragua. Eventually, the facility has stopped production, however-but not because of the pressure to make environmentally favorable fish! 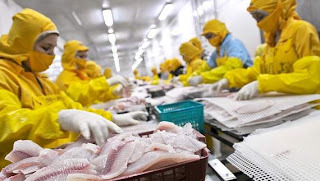 China has run the Nicaraguans out of the market of cheap tilapia fillets. Nicaragua is at the same time, a small, impoverished piece of the Latin American reality, and an historical and literary force unto itself. To understand Nicaragua as an outsider compells a great deal of reading. Here, we present yet another set of readings for the thoughtful Nicaragua lover. Plenty of great literature is about and by Nicaraguans, and we recommend reading it all. Life as a Anglo child among the Caribbean people of Nicaragua brought this author a universe of novel experiences which he retells with grace and sensitiviy toward the subject. The Creoles and the Miskito people, little understood or accepted on the Pacific side of Nicaragua, are revealed among his anecdotes written a century ago. Life in state and class oppression and struggle to achieve liberation united with Christian religious principles among the common people of Nicaragua. The result was explosive. The will of many men and women solidify against the dictatorship, and a call to faith was made and heard among many, breathing life in praxis to the concepts of liberation theology. A prime document in the history of Nicaragua, The Gospel in Solentiname is also a call to arms to people of faith, through the exegetic words of poor, rural people seeing Jesus of the Gospels in their midst, sharing their lives and their injustices. Ernesto Cardenal is a Trappist monk, studied under Thomas Merton in Gethsemane, Kentucky, and he participated in the founding of an intentional community in the Solentiname islands in southern Lake Nicaragua. The Country Under My Skin is the autobiography of Gioconda Belli, the story of a young woman poet from a well-to-do family who chooses to join the reviled Sandinista rebels. Her first-hand accounts serve as valid historical accounts as well as moving personal reflections and worthy prose. Belli participated actively in the rebellion against the Somoza dictatorship, and later in the Sandinista society and government. Among the most prominent writers in the Spanish language, Ruben Dario was a master of poetry and prose, and a modernist for all times. His writing often transcended Nicaragua and his readers are found throughout the Spanish-speaking world, for his precise and universal use of language and cadence. Azul, a collection of poems and prose, was written when he was only twenty-one years old, and today excerpts from it are pillars of the Spanish language. All Nicaraguans can quote passages from his work. To know Nicaragua is to know Dario, and vice versa. Ben Linder's death and life are remarkable even today, in part because of his novel choice in life: to work for no income as a volunteer in revolutionary Nicaragua. He was killed in a military operation by contra rebels, just like thousands of other young men and women. Unlike most of the others, however, Ben Linder was a US citizen working as a civilian in Nicaragua. Ben was targetted for assassination because he was making lives better for poor Nicaraguans in the remote countryside. Denial, resistance, and later, outright hostility toward Ben's family and others who demanded to know the details of US involvement in his death illuminated a sad reality: The US government of Nicaragua sponsored terrorism in Nicaragua. This would be a thrilling story, if it were not true. Instead, it is a chronicle of a country caught in a cold-war crossfire, in the microcosm of one martyred American young man and his coworkers. This biography, written by Joan Kruckewitt, is a worthwhile read. The most cogent intellectual critic of US intervention in Nicaragua during the 1980's was Noam Chomsky, who re-interpreted the Reagan administration's zeal to undermine the Sandinista administration, using his skills in communication. "One man's freedom fighter is another man's terrorist" and similar concepts were embodied in the contra war and revealed by Chomsky's brilliant analysis. Nicaragua was a prized piece on a chessboard for the US government, and Chomsky provides key features in the dissection of use of language in the war of words. Everyone needs a reading list. And if you are interested in Nicaragua, you will find many, many layers to the story of what makes this country the way it is. There is plenty to read to help you understand better the country "where lead floats and cork sinks". Here we present a reading list which, we think, provides a sound basis for the reality of Nicaragua. From fiction, to documentary, we cover several items available to read which introduce Nicaragua. This is the first of several parts, because, although Nicaragua is small and poor, it is rich in historical and literary heritage. Please consider making any purchases of these books through our links. Every time you purchase a book using our link, we obtain credit that helps us obtain field guides, reference books, and other books that are vital to our work. Ephraim George Squier served as an envoy from the US government to Nicaragua in the nineteenth century. His task was to document the geography, society and culture of Nicaragua, which he resumed in a fine book. It is a shame that this was out of print and that hardback copies are rare and very expensive. This book discusses the pressure of the Roman Catholic Church on the local people to destroy all precolombian statues, and his efforts to save some of them from destruction (see the San Francisco Convent in Granada for some of the statues he saved). His activities in the region are a prologue to the transoceanic canal, later constructed in Panama. He wrote sympathetically of Nicaragua, giving ample descriptions of the people and land in this travelogue. Among the ineludable realities of Nicaragua is the conquest of Latin America by the Spanish and Portuguese, an event which transformed a continent forever. Eduardo Galeano documents the subjugation of an entire race as serfs in a feudal system imposed by the colonizers, which in turn subjugates generation after generation of descendants in despotism. We need not look to Europe and Asia to find police states, massacres, state-sponsored terrorism, proxy wars, famines, and fascism, because they are all contained in the history of Latin America, and retold in this book. Galeano once said of himself, "I'm a writer obsessed with remembering, with remembering the past of America above all and above all that of Latin America, intimate land condemned to amnesia." Using historical documents, Galeano recreates centuries of history from the perspective of the oppressed, presenting the impacts of wars, colonizations, and policies decided in Europe and in the capitals of these countries on the disenfranchised. The current reality of Nicaragua is immersed in the common history of Latin America, a story whose perspective of oppression is told best by Galeano. In their first encounter, Hugo Chavez gave a copy of this book to Barak Obama. Thomas Belt was an English mining engineer who worked in Nicaragua in the nineteenth century. His travels through the countryside, from gold mine to gold mine, provided him with opportunities to pursue his passion-tropical biology. He documented the mutualistic intereactions between Pseudomyrmex ants and the Bullthorn acacia which provides the ants with shelter and food. His incisive descriptions of nature are used in tropical biology texts. His observations of human nature were equally acute, and are told in an engaging style meant for the general reader. Many of his anecdotes on the landscapes and rural people, though more than a century old, ring true today. He struggles with the procrastination endemic to the culture, hails the affection and hospitality abundant among his experiences, and provides the reader detailed landscapes of towns, villages and countryside, in many ways still valid today. No discussion of Nicaragua can omit the insurrection against the Somoza dynasty and subsequent revolutionary period. Two monumental, successful hostage events occurred during the insurrection, both of which liberated Sandinista guerrilla fighters from Nicaraguan prisons and heightened the image of the revolutionary movement. Gioconda Belli fictionalizes a hostage-taking event, creating a fiction that embeds the issues of political, social and gender liberation in a thrilling story. A young, apolitical woman from the middle class becomes a hostage-taking revolutionary commando in a series of events that seem at once improbable and very convincing. The story gives an excellent insider's view of Nicaraguan middle class society from a woman's perspective. 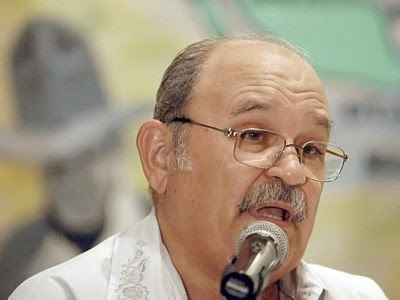 Omar Cabezas did not come from a prestigious or wealthy family, but he joined the Sandinistas as a teen. He tells his story in a self-effacing, relaxed prose, using Nicaraguan street language, of the formation of a university student leader into a guerrilla fighter: indecision and decision, glory and boredom, illness and banal humor. A well-told story from a more proletarian point of view, in contrast to most who chronicled the period. Blood of Brothers gives a well-documented, balanced account of events throughout the insurrection and the Sandinista period. Stephen Kinzer combines an authoritative first-hand account of important events with documentary evidence to make a very readable chronicle of the period, told with the precision of a journalist at his best. He portrays skillfully many perspectives inside a divided country during a time of war. Claribel Alegria tells the chilling story of the only modern head of state to be assassinated in exile-Anastasio Somoza. Argentine revolutionaries taking refuge in Nicaragua learn of his presence in Paraguay and undertake a suicide mission-to kill Somoza in the most controlled police state in the western hemisphere. It would make a great thriller novel, but it is real. A ruthless dictator meets a violent end, told by a great writer who was herself a victim and refugee from the Somoza dictatorship of Nicaragua. No history would be fairly told without considering all sides. Anastasio Somoza Debayle tells his own story of the last years of his administration, blaming principally Jimmy Carter for removing support for him and allowing the "communist" Sandinista revolutionaries to take power in Nicaragua upon his departure. The Nicaraguan Revolution was in large measure a transformation of the role of women in the Latin American society. Margaret Randall chronicled the stories of women as participants in the Nicaraguan society in a series of ethnographic sketches, treating women at several levels of Nicaraguan society, in their own voices. Her first book on the subject, Sandino's Daughters, is juxtaposed with Sandino's Daughters Revisited, in which she considers the lives of the same women post-Sandinista period of the 1990's. A picture is truly worth a thousand words, when the photographer is Susan Meiselas. In this collection of photos, she captures the violence of the insurrection, the cruelty of the National Guard, the absurdity of the ruling class during a bloody war, the horror and sometimes, bravery of common people in the face of tragedy. In her pictures is the collective memory of a nation living a terrible, hopeful, and fateful period. Julio Cortazar was an Argentine writer who sympathized greatly with the Sandinista Revolution. His chronicle, Nicaraguan Sketches , defends the process of the 1980's in a series of sketches discussing a wide variety of topics.